The answer was the creation of a tiny buoyancy device that fits around the creature. Ada essentially "sits" in the device something like a watery wheel chair. Thus relieved of her limitation she is free to be a fish once again. The other fish in the tank seem to be totally unaware of her little "life belt" and life continues as normal. Ada is able to swim as she wants to and even bump her nose against the glass again. 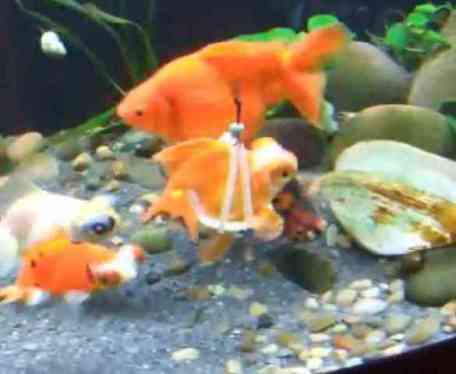 Buoyancy problems are common among goldfish. This is apparently caused by a complication of their swim bladder. The bladder is a two-chambered air-filled organ that helps them maintain their balance when not moving. This sort of issue can be brought on by changes in water temperature, pressure from food or air in the stomach, and even infection. Dietary changes, clean water, and the addition of tonic salt to the tank are all ways to help a fish with this problem. If none of this works, there may be permanent damage to the fish. Then a little life-belt might be just the thing. Without her owner's help and ingenuity, Ada may have gone the way of the circular cemetery by now. Lamprey -- The Scary Animal Video of the Day!! !